This month I took one of the most amazing trips ever. And this time it wasn't about wine. It was about nature; wild, extensive nature of dazzling beauty - Botswana and Zimbabwe. For about a week we were fully disconnected from the rest of the world, visiting the Okavango Delta and Chobe National Park. It was very exciting to see all the wildlife, and I was impressed by the expanse of nature, the only sign of humans being the endless dirt roads crossing the untouched forests and grasslands. 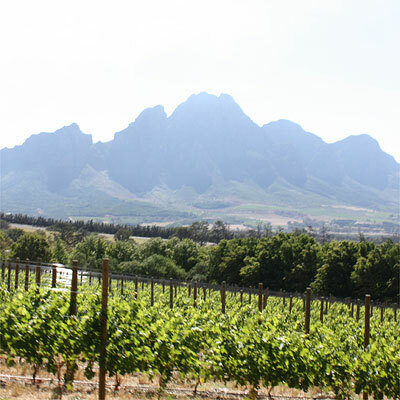 Despite my awe, I will talk about something else in this posting, and that's what we did on the last day of our trip: visiting Anthonij Rupert Wines in Franschhoek. That makes more sense on a wine blog and moreover, it was an interesting visit. A known saying in the wine industry is: you need a big fortune to make a small fortune. And this rule definitely applies here. The story starts with the late entrepreneur and philanthropist Anton Rupert, who gained his first fortune by introducing the Peter Stuyvesant brand to the African continent. Many thriving business initiatives followed and made Mr Rupert - who started with almost nothing - one of the richest people of South Africa. Today Mr Rupert's son Johann (born 1950) is the head of all family businesses and organizations, and he must be one of the most energetic and strong-minded people I've ever met. This powerful mind is also reflected in his wine, and in the winery. Anthonij Rupert Wines is named after Johann Rupert's younger brother, who was killed in a car accident in 2001. 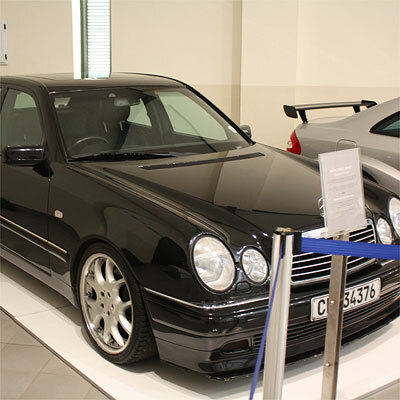 Nevertheless, there's a beautiful car museum as well on the grounds of this wine estate. Anthonij Rupert Wines consists of four farms, and we visited the L'Ormarins where the central vinification facility is located. Johann Rupert's approach is uncompromising: the investments for the 007-like cellar must have been enormous. But the proof of the wine is in the drinking, so the first thing we did was taste. Personally I was most enthusiastic about the estate's basic wines. There are the L'Ormarins and the Terra del Capo wines. Expressive whites and quaffable reds. I liked the Arné for example, a slender, somewhat smokey and peppery blend of Merlot and Sangiovese. It has the agility and freshness that I like to find in a wine. Then there are the ambitious Anthonij Rupert mono-cépages; we tasted these four: Merlot, Cabernet Franc, Cabernet Sauvignon and Syrah. 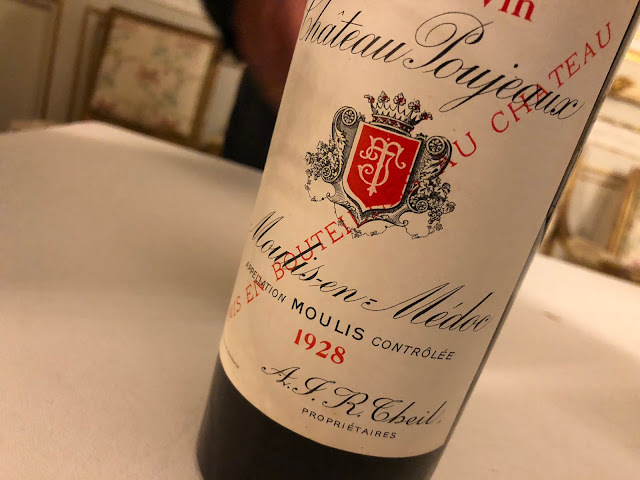 Perhaps the shortest way to characterize these cuvées is that I correctly identified the wines as being made with the advice of Michel Rolland. The style is ripe, leaning towards very ripe (especially the Merlot), and powerful. This is not a matter of quality, it is a matter of taste. For me these wines are a bit too heavy and meaty. At the same time it was crystal clear that in its segment these wines are impressive. My personal favourites were the Cabernet Franc (earthly, more dry) and the Syrah (energetic and spicy). After the tasting we toured the winery which is, indeed, impressive. The idea to use gravity is extended to the max: the winery is actually a tower. 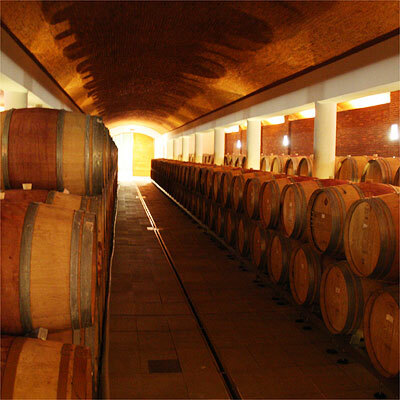 The grapes enter the building at the top and from there they merely trickle down until they reach the barriques in the cellar. I have seen many ambitious wineries in Bordeaux, and this one easily maintains itself within the group of - say - the ten most advanced wineries. 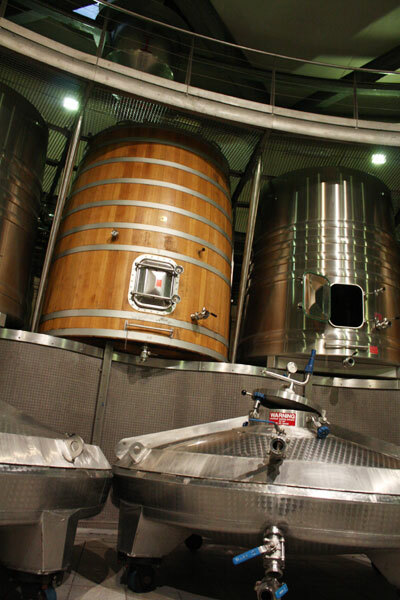 The strictly selected grapes are distributed over different types of fermentation vats (we're one level down now): wood, stainless steel and concrete. 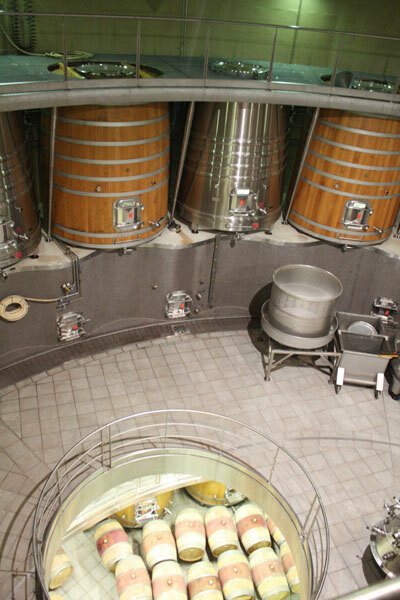 There is a huge wheel above the circle of vats which is used to fill and refill the tanks. For the remontage a sort of flattened tank is used (see picture) that can be entirely hauled up in order to be emptied in the fermentation tanks - an ingenious manner to perform a remontage. Finally we arrive at the barrels in the cellar. The grands vins stay on barrel for no less than 18 to 24 months, and these barrels are rolled regularly so the wine intermingles nicely with its lees. Fining is not applied, filtering is. Acidification is done to get to a good balance in the wines.